"This is so easy and yummy!" Preheat oven to 350 degrees F (175 degrees C). Prepare a 13x9-inch baking dish with cooking spray. Heat a large skillet over medium-high heat. Cook and stir beef and onion in the hot skillet until beef is completely browned, 5 to 7 minutes; drain and discard grease. Stir tomato sauce, black beans, diced tomatoes with lime juice and cilantro, corn, and chopped green chiles into the ground beef mixture; season with chili powder, cumin, garlic, oregano, and red pepper flakes. Reduce heat to low and cook mixture at a simmer for 5 minutes. Spread about 1/2 cup beef mixture into the bottom of the prepared baking dish; top with 3 tortillas, overlapping as needed. Spread another 1/2 cup beef mixture over the tortillas. Sprinkle 1 cup Cheddar cheese over beef. Finish with layers of remaining tortillas, beef mixture, and Cheddar cheese, respectively. Bake in preheated oven until heated throughout and the cheese is melted, about 15 minutes. Cool 5 minutes before serving. The flavor was really good, but the flour tortillas turned go a gooey nasty mess! 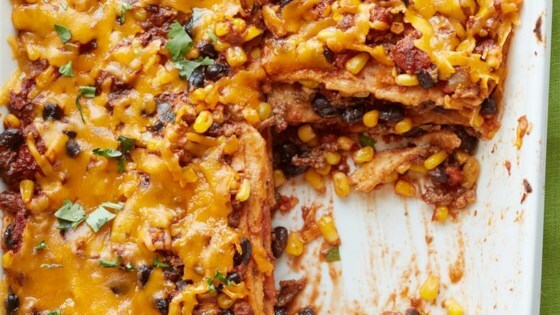 I will make this again, just use crisped corn tortillas or tortilla chips. The whole family loved this. I used about 2 lbs of ground beef in the recipe (i have 2 teenage boys that eat a lot) and served it with sour cream and guacamole. This went great with sour cream!